This week my husband and I celebrated our 6th wedding anniversary. In honor of the day I wanted to make something special, but my husband doesn’t get into a lot of the corny love stuff. He makes everything more complicated, I really have to put some thought into anything I do. When I saw the saying “home is where my husband is,” I knew that was something he would think was sweet. We have moved a lot, and since we just move it is especially true. I found this pallet looking wood piece at AC Moore and painted it to go with my decor. Having just moved paint is one thing we have on hand, and with just a few coats of crisp white paint it was ready to go. I designed and sized my saying to fit accordingly, cut and applied the vinyl with transfer paper to my wood piece. I love how easy my Silhouette makes stuff. When I see a cute saying, I just break out the vinyl, my machine and in no time I have a beautiful creation. It really was done and on the mantel before my son was up from his nap. And, yes, my husband did love it! He loved what it said and how it turned out. I have to say I was pretty proud of myself too. This is such a fun idea — and I love the quote! I really love this. It’s simple and sweet and says exactly what you feel. Perfect! 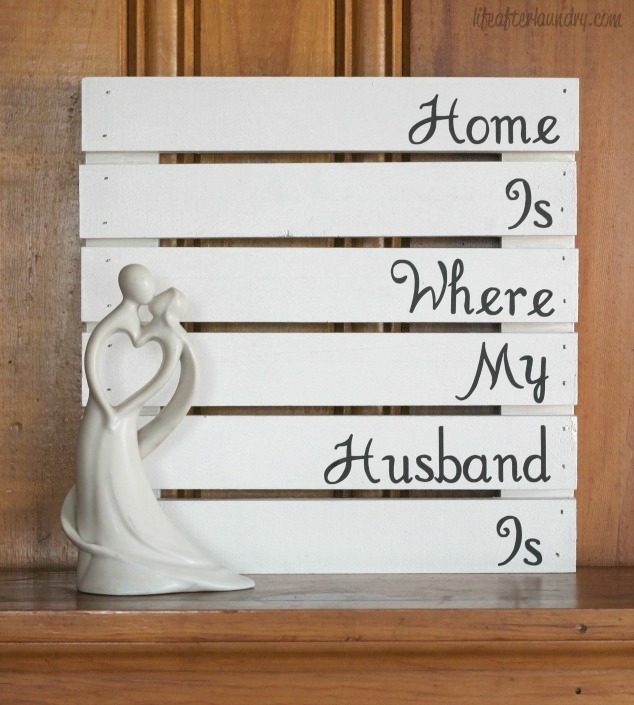 I love the phrase: home is where my husband is. It is absolutely true. What a darling project to make for your anniversary. Congrats. Laura| BakingOutsidetheBox recently posted…Baking on the Grill — Who Knew? What a sweet saying and thank you for the review. It’s always helpful to hear these things before buying. Love the name of your blog! And love this post, so creative! Stopping by from pin it Thursday! You make me want a machine really badly! Love it!!! Thanks for linking up to Tips and Tricks!